The User Network Interface (UNI) Manager project within OpenDaylight provides data models and APIs that enable software applications and service orchestrators to configure and provision connectivity services; in particular, Carrier Ethernet services as defined by MEF Forum, in physical and virtual network elements. MEF has defined the Lifecycle Service Orchestration (LSO) Reference Architecture for the management and control of domains and entities that enable cooperative network services across one or more service provider networks. The architecture also identifies LSO Reference Points, which are the logical points of interaction between specific functional management components. These LSO Reference Points are further defined by interface profiles and instantiated by APIs. 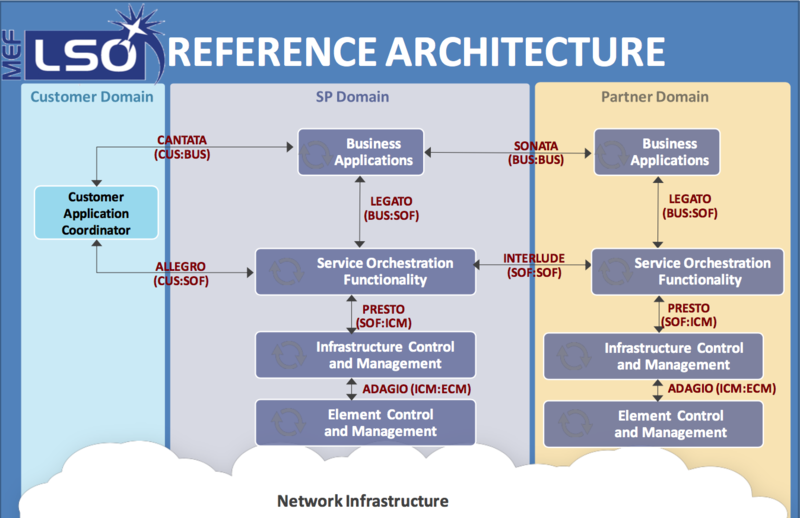 The LSO Reference Architecture is shown below. Note that this is a functional architecture that does not describe how the management components are implemented (e.g., single vs. multiple instances), but rather identifies management components that provide logical functionality as well as the points of interaction among them. An application/user can interact with Unimgr at either the service orchestration layer (Legato) or the network resource provisioning layer (Presto). Replace localhost with the IP address or hostname where OpenDaylight is running if you are not running OpenDaylight locally on your machine. See also the Unimgr Developer Guide for a full listing of the API.